TCP's Allusion LED light bulbs are dimmable and 85% more energy efficient than halogen replacements. It only consumes 10 watts when compare to the equivalent of a 65 watts incandescent light bulbs. 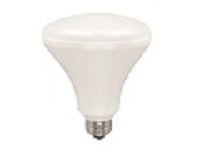 They have an output of 675 lumens with a color temperature rating of 2900k to 2000K. Also to include that these light bulbs is shatter-resistant and have a long average lifetime rating of 25,000 hours. These light bulbs are made with absolute quality to give lighting in outdoor settings and enclosed fixtures. Most of all they are UL approved with a 5 Year Warranty.